The most obvious way to depict relief is to imitate it at scale, as in molded or sculpted solid terrain models and molded-plastic raised-relief maps. Because of the disparity between the horizontal and vertical scales of maps, raised relief is typically exaggerated. On flat paper maps and computer screens, terrain can be depicted in a variety of ways, outlined below. The most ancient form of relief depiction in cartography, hill profiles are simply illustrations of mountains and hills in profile, placed as appropriate on generally small-scale (broad area of coverage) maps. They are seldom used today except as part of an "antique" styling. 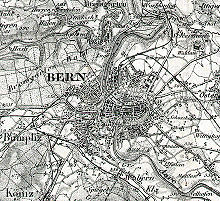 Dufour map of Bern (1907); this is a shaded hachure map. Hachures are also an older mode of representing relief. They are a form of shading, although different from the one used in shaded maps. They show the orientation of slope, and by their thickness and overall density they provide a general sense of steepness. Being non-numeric, they are less useful to a scientific survey than contours, but can successfully communicate quite specific shapes of terrain. Hachure representation of relief was standardized by the Austrian topographer Johann Georg Lehmann in 1799. Contour lines (or isohypses) are isolines showing equal elevation. This is the most common way of numerically showing elevation, and is familiar from topographic maps. Most 18th and early 19th century national surveys did not record relief across the entire area of coverage, calculating only spot elevations at survey points. The United States Geological Survey (USGS) topographical survey maps included contour representation of relief, and so maps that show relief, especially with exact representation of elevation, came to be called topographic maps (or "topo" maps) in the United States, and the usage has spread internationally. On maps produced by Swisstopo, the color of the contour lines is used to indicate the type of ground: black for bare rock and scree, blue for ice and underwater contours, brown for earth-covered ground. The Tanaka (Relief) Contours technique is a method used to illuminate contour lines in order to help visualize terrain. Lines are highlighted or shaded depending on their relationship to a light source in the Northwest. If the object being illustrated would shadow a section of contour line, that contour would be represented with a black band. Otherwise, slopes facing the light source would be represented by white bands. This method was developed by Professor Tanaka Kitiro in 1950, but had been experimented with as early as 1870, with little success due to technological limitations in printing. The resulting terrain at this point was a grayscale image. Cartographer Berthold Horn later created software to digitally produce Tanaka Contours, and Patrick Kennelly, another cartographer, later found a way to add color to these maps, making them more realistic. There are a number of issues with this method. Historically, maps using Tanaka Contours could only be produced on gray backgrounds, which technology was unprepared for. This method is also very time consuming. In addition, the method takes into account mainly aspect and elevation, whereas slope is un accounted for resulting in a very terraced appearance. Hypsometric tints (also called layer tinting, elevation tinting, elevation coloring, or hysometric coloring) are colors placed between contour lines to indicate elevation. These tints are shown as bands of color in a graduated scheme or as a color ramp applied to contour lines themselves. Hypsometric tinting of maps and globes is often accompanied by a similar method of bathymetric tinting to convey differences in water depth. Shaded relief, or hill-shading, shows the shape of the terrain in a realistic fashion by showing how the three-dimensional surface would be illuminated from a point light source. The shadows normally follow the convention of top-left lighting in which the light source is placed near the upper-left corner of the map. If the map is oriented with north at the top, the result is that the light appears to come from the north-west. Although this is unrealistic lighting in the northern hemisphere, using a southern light source can cause multistable perception illusions, in which the topography appears inverted. Shaded relief was traditionally drawn with charcoal, airbrush and other artist's media. The Swiss master Eduard Imhof is widely regarded as the master of manual hill-shading technique and theory. Imhof's contributions included a multi-color approach to shading, with purples in valleys and yellows on peaks, which is known as “illuminated shading.” Illuminating the sides of the terrain facing the light source with yellow colors provides greater realism, enhances the sense of the three-dimensional nature of the terrain, and make the map more aesthetically pleasing and artistic-looking. Shaded relief is today almost exclusively computer-generated using digital elevation models (DEM), with a resulting different look and feel. Much work has been done in digitally recreating the work of Eduard Imhof, which has been fairly successful in some cases. The DEM may be converted to shaded relief using software such as Photoshop, QGIS, GRASS GIS or ArcMap's Spatial Analyst extension. Computer-generated effects to increase the realism of shaded relief include resolution bumping, the blending of hill-shades at different scales, and sky model shading, which simulates ambient light on terrain from many directions. Web version of Patteron's Physical Map of the Coterminous United States. Note the appearance of the Rocky Mountains in the full size version. Pioneered by Erwin Raisz, this technique uses generalized texture to imitate landform shapes over a large area. A combination of hill profile and shaded relief, this style of terrain representation is simultaneously idiosyncratic to its creator -- often hand-painted -- and found insightful in illustrating geomorphological patterns. More recently, Tom Patterson created a computer-generated map of the United States using Erwin Raisz's work as a starting point, the Physical Map of the Coterminous United States; he called the technique plan oblique relief. Emphasizes hydrological drainage divide and watershed streams. Portrayal of relief is especially important in mountainous regions. The Commission on Mountain Cartography of the International Cartographic Association is the best-known forum for discussion of theory and techniques for mapping these regions. ^ Patrick Kennelly & A. Jon Kimerling (2001) Modifications of Tanaka's Illuminated Contour Method, Cartography and Geographic Information Science, 28:2, 111-123. ^ "RELIEF (TERRAIN) DEPICTION." UNBC GIS LAB: GIS & Remote Sensing. University of Northern British Columbia, n.d. Web. 28 Sept. 2013. ^ Eduard Imhof (2007-06-01). Cartographic relief presentation. Esri Pr. ISBN 978-1-58948-026-1. ^ Jenny, Bernhard; Hurni, Lorenz (2006). "Swiss-Style Colour Relief Shading Modulated by Elevation and by Exposure to Illumination". The Cartographic Journal. 43 (3): 198–207. doi:10.1179/000870406X158164. ^ Tom Patterson, "See the light: How to make illuminated shaded relief in Photoshop 6.0," http://www.shadedrelief.com/illumination/ (accessed 30 October 2017). ^ Patterson, Tom., "Resolution bumping GTOPO30 in Photoshop: How to Make High-Mountains More Legible," http://www.shadedrelief.com/bumping/bumping.html (accessed 24 September 2012); Kennelly, J., & Stewart, J. (2006). A Uniform Sky Illumination Model to Enhance Shading of Terrain and Urban Areas. Cartography and Geographic Information Science, 33(1), 21–36. https://doi.org/10.1559/152304006777323118. Wikimedia Commons has media related to Topographic shading.